I was a young boy, just striking out on my own path at the town library when I first came across Jules Verne. My introduction to the French man's works of speculative fiction (as sci-fi used to be known) came in the form of the Journey to the Centre of the Earth. I loved it; I still do. There is one difficulty with Verne's work, however. It's all written in French, and so every time I read his work, it is through the filter of a translator's pen. This shows up in Journey to the Centre of the Earth in the fact that there are two main translations of the book, and they're completely different. The main character in one of the versions is a completely different man, in name as well as character, from in the other. So it seems than game developers seem to like following in this tradition of 're-interpretation' rather than translation. 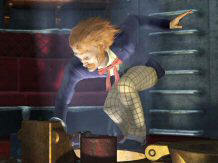 In particular, the recent “Journey to the Centre of the Earth” and “Return to Mysterious Island” games were inspired by Verne's stories, rather than faithful reproductions. In this context, I was concerned to find out what Kheops Studio (the makers of the “Return to Mysterious Island” game) had done to Verne's story, “Journey to the Moon”. Well, the answer is that they've done the same as they did with their previous game - Voyage is a Verne-esque telling of a story that starts with an idea that he had. This is not to say that the result is somehow 'wrong', it would simply be a mistake to say that Kheops have told Verne’s story verbatim. What we have instead is a nonlinear, point-n-click, mostly pre-rendered 360° bubble-based adventure game telling the story of Michel Ardan, a wild-hair, moustachioed 19th century French explorer, and his journey to the Moon. And, yes, he actually reaches the Moon, where Verne's characters did not. The game begins with our hero, Michel Ardan, waking up in a bullet-like space capsule in the company of Barbicane and Nicholl - his fellow space explorers, after the violent launch of the capsule towards the Moon. However, he soon discovers that all has not gone well since the launch. As I've already made it clear that Michel reaches the Moon, I think it fair to also mention that he also encounters intelligent life there. The backbone of the story is Michel's encounters with the Selenites, (from the Greek 'seleno', being the Moon) and his efforts to return to the Earth. Along the way he discovers some of the story of the Selenite civilisation and their relationship with Earth. And, of course, there are plenty of puzzles along the way, but then it wouldn’t be much of an adventure game without them. In this highly puzzle-oriented game, the puzzles are pretty varied. Some involve the decipherment of the Selenitic written and spoken language – a tuneful thing that’s not as hard as it sounds; a fair few puzzles involve combinations of inventory items, some are mathematical in nature, some mechanical, and some are just pure logic. A number of the over-arching goals can be achieved through a variety of means. This is the source of much of the game’s nonlinearity. If you get stuck somewhere, you can often make progress in other parts of the game before coming back to the sticking point. In addition, there are a number of optional side puzzles that aren’t essential to your progress towards home, but which reveal some extra facet of lunar life. From roughly halfway through the game (at least as I played it), you gain a small ‘helper’. The ‘helper’ is there to reveal information, clues and your score. Certain puzzles require you to have achieved a specific number of points before you can obtain information or inventory items. However, obtaining sufficient points is again possible in a variety of ways. Solving parts of the Selenitic language, or deciphering mathematical puzzles or manufacturing chemical substances using the Selenitic machines all improve your score. Ardan automatically keeps a comprehensive log of his experiences. This includes some of the conversations, the details of his investigations as to what happened in the space capsule before he woke, and a number of key diagrams regarding his objectives later in the game. A notable pair of features in this point-n-click adventure is the inclusion of a small number of timed sequences early in the game, followed by some hand-eye-coordination-based jumping puzzles. Unfortunately, these puzzles all result, upon failure, in the death of Ardan, but he is always resurrected to a point immediately before the timed sequence or jump began, so there’s no real penalty in failure, other than a certain gathering frustration. On the plus side, once each jump has been successfully performed, Ardan will be able to repeat them without the player having to beat the puzzle again. I found these a minor irritation rather than a serious problem. Graphically, the experience of Voyage is colourful and imaginative. With our modern knowledge of the Moon, we would expect the palette of this game to be rather dull and leaden, but Kheops Studios clearly know better, with good texturing, a rich palette of colours, refined animation, and very detailed modelling. Most of the audio in the game is top quality. The music is unobtrusive, but appropriately used to set the mood at various stages of the game. The voice acting of the Selenites is excellent – I particularly enjoyed their native voices, which are rather harmonious. The English voice acting was good, with the exception of Ardan himself, whose narration and accent I found jarred slightly. I think he was supposed to sound like an educated Frenchman speaking English – presumably he sounds better in the French version – but in English he came across as stilted and slightly manic at the same time. Not having completed a Kheops Studios’ game before, I didn’t realise quite how much they like inventory combining puzzles. However, to their credit, the required combinations aren’t extraordinarily illogical, though some are surprising. A nice feature here is the pictorial log that is kept of all the successful combinations you’ve made throughout the game – this simplifies the task of re-creating earlier combinations later in the game. An intriguing novelty in Voyage is the requirement that you don’t just have to click on a button to make the machines work, you have to understand what those machines are going to do. A number of the machines will ‘work’ by you pressing buttons, but will only do the ‘right’ thing when you understand them properly. There are at least three puzzles that can be attempted several times, to a number of standards – in each case, the lowest standard is sufficient to ‘solve’ the puzzle, but you can significantly improve your overall score by achieving the higher levels. A feature here that is rather useful is that if you find that you’re weak in one puzzle – perhaps figuring out the Selenitic mathematics defeats you – you may well be able to make up for it with the sounds of the their spoken language. Now we reach the only really odd thing about this game. Although there are five profiles under which you can save your game, you must select your profile during level 1 of the game – however, there’s no warning as to when level 1 ends, so no indication when you should choose your profile. The manual states that level 1 is the capsule level, but it’s not clear whilst you’re playing the game when this level ends. So, I suggest that anyone playing this game saves their first game immediately the first cut-scene ends – thereby choosing a profile and eliminating any risk of getting caught out like I did. Of course, if you’re not sharing your computer with other people, this oddity problem won’t even affect you, but it did me, so I choose to mention it. This was an enjoyable telling of a Verne-inspired tale, though I’ve found it helpful to ignore the connection with Monsieur Verne in the long run. I would certainly play another game by Kheops Studios. So, to summarise: a point-n-click adventure, featuring a good story, some hand-eye coordination, a few timed sequences, plenty of opportunities to die, but with immediate resurrection to before the fateful decision was made, unlimited saves, but an odd profiling system, a variety of logical, mathematical, inventory, linguistic and mechanical puzzles, one musical puzzle, and no slider puzzles, nor mazes. From a technical standpoint, there were very few graphical bugs, nor audio glitches, except during the final cut-scene, which was a shame, as it concludes with a nice little twist to the story. The game has no patches, and no serious crashes. So, all in all, a good game, but not spectacular, hence the final grade.